Hey guys, I got this as an early Christmas present off my friend and knew I had to do a review on it. It's the SEVENTEEN Nail Stash Collection. 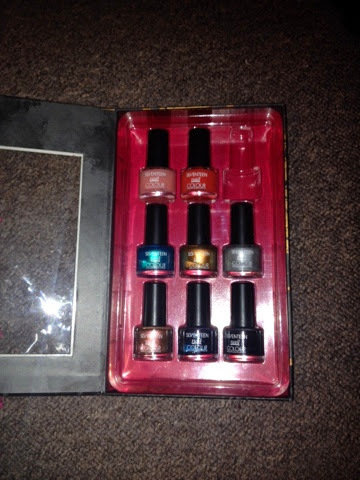 In this set there are nine mini bottles of nail varnish, 4 solid colours, 4 metallic colours and one glittery one. The colours are: (in order) Pink Lemonade, Caribbean Coral, Ruby Gem, Peacock, Fury, Moonstruck, Copper, Navy Glint and Nightshade. They are all stunning colours and go on very easily. They are mini bottles so the brush is smaller than what the full size one would be but it's more accurate. My favourite is the Peacock and Ruby Gem, The peacock reminds me of petrol. You know- when you see petrol spilt on the road and It looks like a rainbow type of pattern but the nail varnish is so much more vibrant! It has also a gold shimmer aspect to it so it beautiful when it catches the light😊. The ruby gem shade is a gorgeous burgundy shade. It is a solid coulour and spreads evenly. I painted my nails in the dark and in the morning they were a bit amateur looking but we're still very nice. The only shade I am disappointed in is the pink lemonade shade it doesn't have much pigmentation but has the same great formula as the others! When I applied the first coat it looked like I had just applied clear nail varnish but I think it would be a really good French manicure colour!